If you’re missing more short putts than you like, I have something a bit odd for you to try today. I want you to visualize yourself missing 5 -10 footers. I will give you full instructions on what you need to do in a minute, but first a bit of background on this. That’s because you are seeing the golfers playing the best and putting the best…. that’s why they are the leaders in the tournament! Anyway, the stats are that in the range of 5 – 10 feet, pro’s hole them about 50% of the time on average. And they are some of the best putters around. But what I see, and I’m guilty of this myself so I’m not pointing fingers, is golfers, when they miss one of these “makeable putts”, they get down on themselves… like they should make them all the time. The fact is, you’re generally going to make only 50% of your putts in the 5 – 10 feet range. So you’d better get used to missing and mentally prepare yourself to miss. And by mentally preparing yourself to miss, you will make more of these putts. 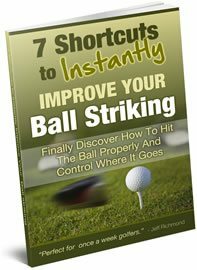 If you’re trying really hard to make a putt because that’s what you SHOULD do, then you will have excessive tension and miss more. But instead, if you do everything you can to make a putt and it misses then that’s the best you can do. And understand that all golfers miss putts. So I have a little exercise that is going to help you to be more relaxed on putts inside of 10 feet. Here is what you need to do. Find a quiet place where you can lie down. Then take a deep breath in and out. Then count from 5 down to 1 and between each count, take a deep breath in and out. As you’re doing this, let all of your thoughts drain out of your mind. Just let your mind be quiet and relaxed. When thoughts come in just let them pass on through. Once you get to 1 then I want you to see yourself on a hole at your local course with about a 7 foot putt. And see yourself playing with other people. Go through your normal putting routine and putt the ball, but make sure you see it just missing and going 3 feet past. Then go through your routine and knock in the 3 footer so you see the ball going right in the middle. It’s important when you are doing this that you don’t get down on yourself for missing the 7 foot putt. Just keep calm and relaxed and keep breathing and staying relaxed. After doing this once, you should then go through this process of visualizing a putt inside of 10 feet and missing the putt and the ball going about 3 feet past. Complete 3 putts like this. Remember, you need NO emotion to missing the putt. Just keep relaxed and focused on the next putt. To end the session you then need to take a deep breath in and count slowly from 1 to 5. Once you get to 5 then open up your eyes and carry on with what you normally do. If you do this exercise consistently, I’m sure you’ll find that you are less concerned with trying to make these “makeable” putts, and will find that they drop in more than they used to. Here’s a warning with this exercise however. I would not advise you do this more than once a day for a week or more. Just do this for 7 days and see how you get on with these short putts. You don’t want to program your mind to miss putts. 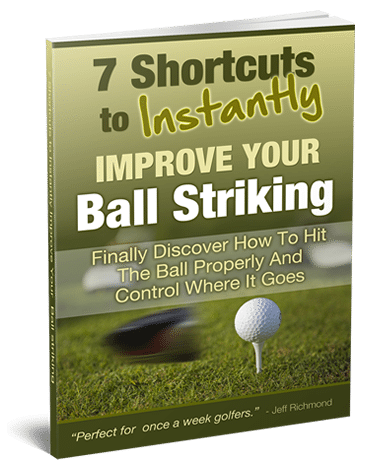 This exercise is simply a way to relieve the pressure of trying to make these “makeable” putts. So I repeat, this is not something you should do long term.